The Holiday Inn Express Hotel Lynchburg is located in the heart of Central Virginia&regs exciting attractions, business and colleges. 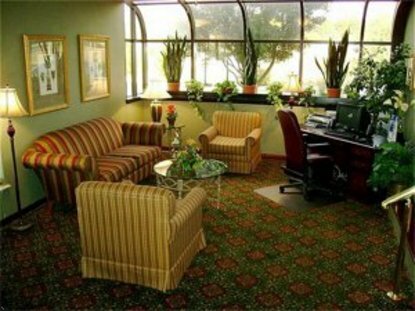 The hotel surrounds our guests with the conveniences that make business and leisure easy. We are located within minutes to major business such as Framatone, Areva, Frito Lay and Georgia Pacific. Any business traveler would agree with the Lynchburg Regional Airport only five miles from the hotel that you couldn&regt get closer. We are also minutes away from several outstanding colleges including Liberty University, Lynchburg College, Sweet Briar College and Randolph-Macon College. With the many scenic and historic attractions so close to Lynchburg, our hotel is a perfect choice. The Blue Ridge Mountains provide a perfect backdrop for a drive to visit the National D-Day Memorial, Appomattox Court House and Thomas Jefferson&regs Poplar Forest. The Holiday Inn Express Lynchburg proudly features a friendly staff and comfortable guest rooms with a spacious work desk with free wired high-speed Internet access. Guests can jump start their morning with our free deluxe continental breakfast. Take a relaxing dip in our seasonal outdoor swimming pool, or work out at our nearby off-site fitness center with complimentary passes available as the front desk. Come let us show you why it is "SMART" to stay with us at the Holiday Inn Express Lynchburg, Virginia. This hotel is committed to providing accessible facilities under the American Disabilities Act. If your accessibility needs are not met, please contact the Hotel Manager on Duty. Should you require additional information regarding accessible facilities for guests with disabilities, please call 1-800-Holiday (U.S. and Canada) or contact the hotel directly. For the hearing impaired, TDD service is available at 1-800-238-5544 within the U.S. and Canada.